Variables allow modifying built-in properties on objects (such as the position of an entity) or the creation and modification of new properties (such as a character’s max movement speed). Exposed variables – variables which are available in code but not available (by default) on an entity. Exposed variables expand the available variables on an entity or screen. This will bring up the New Variable window which is used to select the variable type and set options according to the selected variable type. Exposing an existing variable enables editing a variable which would otherwise only be available in code. The variable dropdown provides a list of available variables for the selected object. Note that this type of variable creation is rarely used. Tunneled variables enable exposing a variable from a contained object to that it is editable at the entity level. 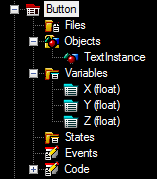 For example, consider a Button entity with a TextInstance object. Buttons often display strings such as “OK” and “Cancel”, so we will want to allow the editing of the TextInstance’s DisplayText property. Change the name to Text. This is not necessary but in this case Text is easier to understand than TextInstanceDisplayText. 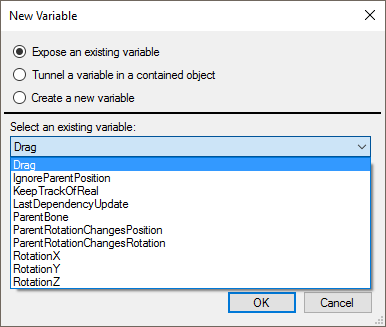 Note that variables can be tunneled by right-clicking on the Variables folder, but this drag+drop approach auto-selects the Tunnel a variable in a contained object option, and selects the object in the Object dropdown.